RIO DE JANEIRO, BRAZIL – BridgeBrazil, a leading school teaching Portuguese language to foreigners, has been awarded government accreditation under the Study in Brazil program. Effective as of this month, the program’s seal of approval places BridgeBrazil among the best educational programs catering to the international market that Brazil has to offer. 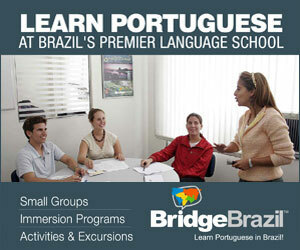 A Portuguese class at BridgeBrazil, photo by BridgeBrazil. “It demonstrates we have gone to great lengths, have been evaluated, and have passed the test!” she affirms. Study in Brazil is a program developed by the Brazilian Exchange Bureau with the aim of promoting Brazil’s education options to foreign students and foreign exchange organizations. The Brazilian Exchange Bureau is managed by BELTA (the Brazilian Educational and Language Travel Association – Latin America’s first and foremost international education association), and supported by EMBRATUR, the Ministry of Tourism’s marketing arm. According to the most recently available statistics from the OECD (The Organization for Economic Co-Operation and Development), in 2009 there were around 3.7 million international students in tertiary education worldwide. Of these, over half were hosted by just six countries – Australia, Canada, France, Germany, the United Kingdom and the United States. As well as promoting Brazil’s foremost undergraduate and extension programs, high school courses and Portuguese language courses to the international market, Study in Brazil also seeks to encourage a more holistic approach to education. 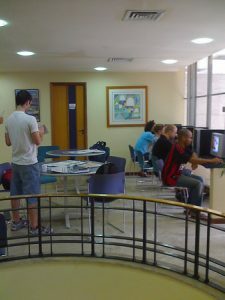 Independent study in the computer room at BridgeBrazil, photo by BridgeBrazil. To this end it is actively supporting innovative programs which combine taught courses with tourism, sports, internships, volunteerism or cultural orientation. BridgeBrazil excels in this area through its Special Programs, which include Portuguese studies with a choice of Brazilian music, history or business and economics. Alternatively, BridgeBrazil offers programs which specialize in developing writing skills or in exam preparation for the Brazilian Ministry of Education and Culture’s official Brazilian Portuguese as a Second Language exam, the Celpe-Bras (a requirement for any foreign student hoping to enroll in a Brazilian university). BridgeBrazil is a subsidiary of Bridge, an international language, education and travel company, leading the field with innovative services for nearly three decades with centers in Brazil, Denver, Chile and Argentina. * This is an Advertorial for BridgeBrazil.